I'm not one to just rush out and get a tattoo on a whim. Well, my first one happened that way, and I've never regretted it. But the others that I have all percolated as ideas for at least a couple of years until I actually pulled the trigger. The very simple one that I just got had probably been kicking around in the back of my head for five to six years. You may know from my profile, or one of my other blogs, that I'm a reader. I mainly read non-fiction these days, but have a soft spot in my heart for some of what I consider modern classics. My bookshelf here at home has three main "special collection" areas pulled out - James Bond novels, Terry Pratchett, and the Tolkien collection. My wife, in fact, rereads the Lord of the Rings trilogy every fall - which is why she routinely thrashes me if we play any of the LOTR trivia games we have. Did I mention that we're dorks? It wasn't too long after the recent Peter Jackson movie trilogy came out that I started running more. One of the things I loved about trail running in particular is that it made me feel like Aragorn, Legolas and Gimli chasing Orcs into Rohan. Especially like on an open hilltop, like many of the areas on the Tahoe Rim Trail. So, those of you who have at least seen the movies may remember the part in Fellowship of the Rings (that was the first one...) where Arwen (Liv Tyler) is taking Frodo by horse to Rivendell, evading the Black Riders. At one point she urges her horse on by whispering to it "Noro lim, Asfaloth, noro lim." Asfaloth being the name of the horse, "noro lim" translates to "run fast" or "go swiftly." Good message for a runner, no? Of course, it would look silly to just have "noro lim" spelled out. So I did a bit of research on which of the Elvish languages Tolkien invented this would be in, and how to write it out in Elvish script. (I know. Dork. Just wait.) 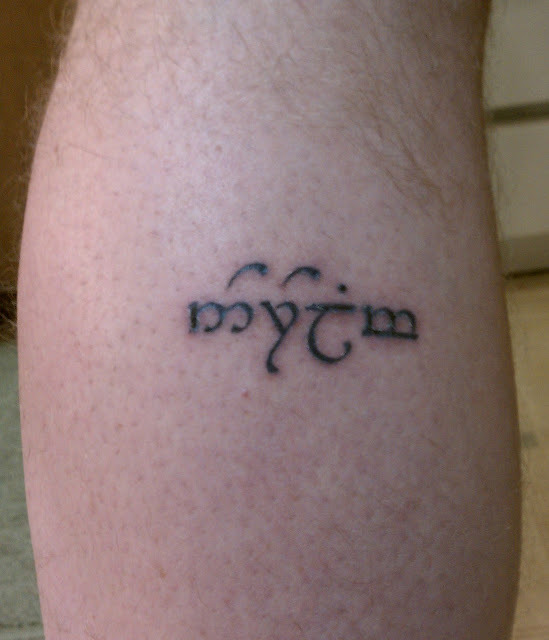 I decided that it would have to be in Sindarin, not Quenya, and that it would be written in the tengwar script. (Warned you.) A bit of looking on the internet found me an Elvish font generator (this is more complicated than I'm making it sound) and I fiddled with it until I came up with something I was happy with. I've kept the printout of the phrase for years, just never bothering to get around to getting the tattoo. My wife was cool enough to get me a gift certificate for Aces Tattoo for Christmas this year, so last week I went down and had it done. Wow! The dorkiest thing you've ever done is the double bleepin' coolest! Now, live up to it! Well, I read to the end of the post, so I guess that makes me a dork too. I don't have tattoos myself, but I like your new addition. Dorky, but definitely cool. That is awesome. Proof that super-cool and super-dorky are not mutually exclusive. Well done!